Why do so many women struggle with self-acceptance? Why do we downplay our gifts, our intelligence, and our callings? Why do we play small? Educated women, creative women, brilliant women often believe lies about themselves and end up living muted lives. Author, speaker and businesswoman, Lisa N. Alexander once lived her life muted but has learned how to live her life in high definition. She’s living out loud. 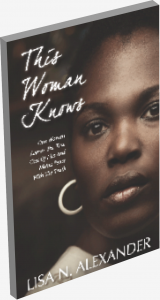 This Woman Knows is Lisa’s empowering story of how she overcame lies, fear and doubt to become a woman who now knows her value and her worth! Hilarious yet thought-provoking, this book will encourage women to face their own fears and live the life God has purposed for them. The book even examines the relevancy of the Proverbs 31 Woman and Lisa’s encounter with a true modern-day version of this biblical icon. Regardless of your age, size, religion or color, the gift inside of you is worthy to be shared with the world and Lisa’s story will inspire you to also become a woman who knows! Purchase the paperback for just $14.36 or buy the Kindle edition for $9.99 and start reading today!